Overwintering a Potted Fig TreeI have a potted fig tree and took it inside my garage, as there will be frost very soon. I have read all the information and will water it 1-2 cups every 4 weeks. Although all the leaves have fallen off, there are several unripened figs left. Should I take them off? 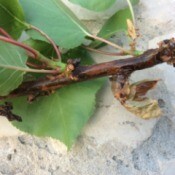 Getting Rid of Bugs on Apricot TreeHow do I get rid of bugs on an apricot tree? Selective Apple BreedingWhat two apples do you breed to make a Granny Smith Apple? Growing Granny Smith Apple TreesDo I need more than one Granny Smith tree to get fruit? 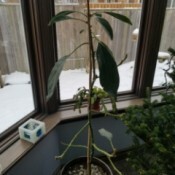 Avocado Tree Left Out in Freezing WeatherI have an avocado tree grown from a seed. It was accidentally left on the porch during a overnight freeze. The leaves have all fallen off and the new dark green growth has blackened and is now decaying. Should I cut below the decaying part and hope for the best? 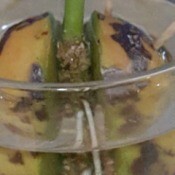 Avocado Growing at an Angle After PruningAfter reading the advice from many online sites to cut the stem of my avocado in half after it reached 8 inches, the top part of the remaining stem died and a new stem sprouted from the side. 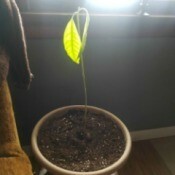 Potted Avocado Tree Losing Leaves and Turning BlackI have an avocado plant that I've been growing indoors for the past 5 years. She's over 3 ft tall! She grew a branch this summer. For the past couple of weeks I noticed she wasn't looking too well, her branch was wilting/turning black and she lost all her leaves so I cut her back thinking that was the problem. 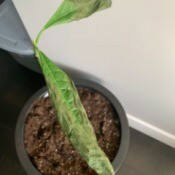 Avocado Tree Losing Its LeavesI just planted a new avocado tree in the soil and its leaves started to fall down like it's dying. I mixed the soil with 50gr of DAP fertilizer. I am worrying what should I do? 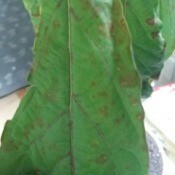 Leaves on Avocado Tree Have Brown Spots and are DyingI've had my avocado tree for a long tine, it was growing great, tall and wide. It was in a small pot before I replanted it into a bigger one, where it had more space. It has been doing great since then. It was growing bigger and bigger, in about 8 months I've decided to replant it into a bigger one. Planting an Avocado TreeThis is my 5th avocado tree and it is still in it's 5 gallon container. 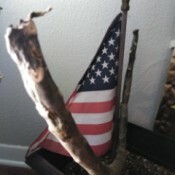 I bought it 9 days ago, and it was grafted. In the last 4 days I noticed the leaves were curling, then fell off. The falling leaves start below and then are going up to the young ones. 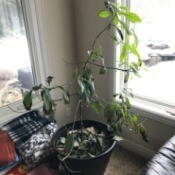 I have already lost 3 leaves and have not put it in the ground. Over Pruned Pear TreeI came home from work yesterday to find that my dad had pruned our pear tree! He cut off all the limbs even though it was totally healthy and still bearing lots of fruit. Will the tree survive or will we need to buy and replant a new pear tree in March? Saving an Avocado Tree Damaged by a Heat WaveThis past July I planted a dwarf avocado tree. A few days later we had an unprecedented heatwave (104deg) for a day. That was enough to damage the top section of the trunk. I decided to cut the damaged portion of main trunk at 3 ft. Is there any hope for this tree? Or should I start new avocado tree? Growing an Avocado from SeedMy avocado tree is 6 months old now. I started growing it from a seed to be a houseplant, however, I'm not sure whether or not it can be. (Do I have to plant it outside?) I would hate for it to not be doing well. Do I just need to get it a large pot or do I have to plant it outside? Leaves on Avocado Tree SunburnedRecently there was a heatwave where I live. My avocado tree, without my knowledge, was sunburned. All of the leaves turned brown and crunchy so I decided to pluck them off. I left a few that still seemed to be healthy and were green however most of them got knocked off in the wind when I was carrying it outside. Transplanted Avocado Tree Not GrowingI have an avocado tree that has grown to be about a foot long from the pit. When I planted the avocado half of the split pit fell off. 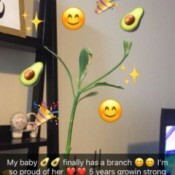 It has been about 2.5 months since then and my avocado hasn't been growing. 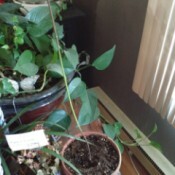 It has two leaves that are limp and what looks like a leaf that started since I replanted it, but hasn't done much. 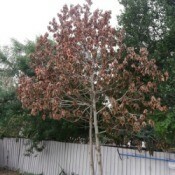 Heat Caused Leaves on an Avocado Tree to Wither and Turn BrownA couple of weeks ago the temperature reached 115 degrees. 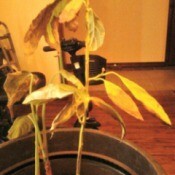 Within a couple days 1/4 of the leaves withered and turned brown. It is a 38 year old tree, well established. What is the best remedy for such a situation? Avocado Tree Losing Its Leaves EarlyMy 15 year old avocado tree is losing its leaves too early. It is July in Southern California. It has lots of avocados on it, that are about half way there and the leaves are dropping like it is post season. They are brown and yellow and hundreds are falling. Caring for a Bonfire Patio Peach TreeHow do I care for a Bonfire patio peach tree? It is in its first year. Growing Rainer Cherry TreesCan I plant and grow a Rainier cherry in tropical weather like in Puerto Rico? 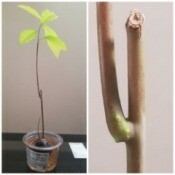 Caring for an Avocado Grown from a PitMy avocado tree was about 16 inches at 2 months and it got damaged halfway up so I cut it off by a new growth just under were it was broken and it started growing an inch below the new growth and out the side instead. Now I'm afraid it will not bear weight well. What should I do? Oranges Falling Prematurely from TreeI am looking for a remedy for oranges falling prematurely. The fruit bearing tips have some yellowish colour. Avocado Tree Has Two Main StemsI have an avocado tree that I grew from a pit, it is like a year old, but has two stems. Should I cut one or leave it like that? Trunk on Avocado Tree Turning Brown and DyingI have had an avocado tree for over a year now and this spring I noticed that the trunk was getting brown. I wouldn't want it to die as it is part of my family. Any suggestions? 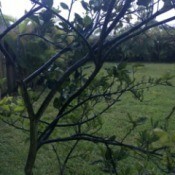 Avocado and Citrus Fruit Tree Health ProblemsI live in southern Florida. My avocado is now only growing little acorn size fruit, that then drop, and leaves. The same is true of my citrus trees which are always covered with a black substance. This has been going on for the past 2 years. It is a shame as they were doing so well. Loquat Tree Leaves Turing BrownI have a loquat tree and the leaves are brown and rusty. What am I doing wrong? Waxy Growth on Top of Avocado TreeThis tree is about 9 months old, and has been pot bound for a month or so (now moved to this big current pot). It seemed to stop growing a few months back presumably when it's roots ran out of room. Only the white waxy stuff on top has been growing. My question is what is it? Transplanted Avocado Tree Is DyingAbout a month ago I moved my 4 year old avocado tree because there wasn't enough space for it to grow. It was thriving. It was moved from the north to the south side of the house. It had been in the shade of a large tree with direct sun in the morning and late afternoon. Now it has sun from mid-morning until dusk. Avocado Tree Dropping LeavesI have an avocado tree that I bought when it was about a foot tall. It is now about three feet tall. It is dropping fresh green leaves. I can send pictures, if you want. I bought it in March and it had been doing very well. 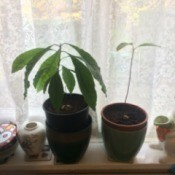 Growing Avocado TreesAbout a year ago I bought two avocado trees from a nursery. They are 1.5 metres tall. We live near the beach so the soil is sandy, but I have fertilised and mulched them. One is OK, but it has heaps of flower buds at the top. Do I remove these? Avocado Tree Never FruitsMy avocado tree, planted in the yard 20 years ago, has never fruited or even had blossoms. Last year it had blossoms, but they didn't turn into fruit. The tree we had cut down about 20 years ago would produce over 400 avocados every year. This tree is a seed from that tree. Indoor Avocado Tree Losing LeavesI have grown my avocado tree from a seed and never pruned it. As new leaves sprout the existing leaves fall off. 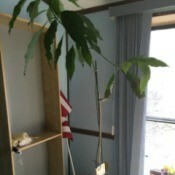 I still keep the tree indoors. What could I do to prevent the the leaves falling off. Planting an Avocado Tree OutsideMy avocado tree has grown to about 3 1/2 feet from the pit. I have had it in the house in a window since starting it, probably 2 or 3 years ago. I want to move it outside either in a larger pot or in the ground. I am in zone 7 or 8 in North Carolina. Can it survive being out doors? Avocado Plant Turning BrownI grew my avocado plant from a seed last year and it has been growing fine, but a while ago the leaves turned brown and fell off. I thought it was because it grew out of the pot and transplanted it, but its turning brown from the top of the stalk down, can I save it? Growing an Avocado from a PitI dropped an avocado pit and it split in half. Can it still grow roots and a stem if I put it back in water? 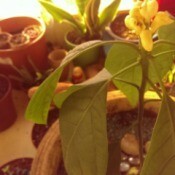 Meyers Lemon Tree Stopped Flowering After TransplantI used to live in New Mexico and my Meyers lemon tree did great. I moved to northern Brazil and brought the tree. It grows great - almost like a bush, but quit producing lemons and flowers. Not sure what to do since it grows great. Leaves Dying and Branches Turning Black on Potted Avocado TreesMy potted avocado trees lost all of their leaves, now the new leaves are coming out and dying; the branches turn black. I tried cutting off the black part, but it keeps coming. Parts of the plants look healthy with new leaves, one flowered this spring. 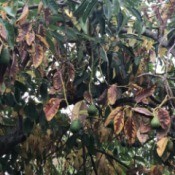 Leaves and Small Avocados Falling Off TreesI have three avocado trees. 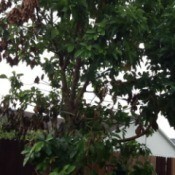 On all three of the trees the leaves and small avocados are all falling off. Does anyone have any idea what the problem could be? Any suggestions would be greatly appreciated. Caring for an Avocado Tree After TransplantingI bought a Hass avocado tree in a 15 gallon pot that already had tiny avocado fruits on it. I re-planted it in a larger container. A few days later, a majority of my tiny avocados fell off. Avocado Tree DyingI put avocado tree fertilizer on a 20 year old avocado tree, to improve the productivity this year. Now it is dying and turning brown. Did I kill it? Do I have hope? What should I do? Planting a Whole LemonI'm curious if anyone has planted a whole lemon in the ground with any success? I have heard that it works, but until today I have not tried it. I'm curious if anyone else has ever tried this, and if it will actually produce. If no one has tried it before, I guess I will keep you updated! Identifying a Disease on an Apricot TreeI have an apricot tree that has a gooey looking substance ozzing out of the stems. Usually it kills the leaves and the tree struggles to produce fruit. Is it fungus or a type of insect that effects it? Avocado Tree Died Back to Below the GraftWe had a Hass avocado tree in California. Then it died or we thought it did. It has begun to grow, but we believe it is below the graft. If we let it grow will the avocados be good to eat? I read somewhere that most of the California avocado trees are grafted on to either Topa Topa or Zutano. Thank you for your help! 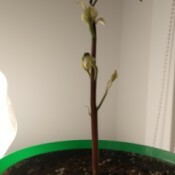 Can an Avocado Plant Survive Without the Pit?My avocado plant started from seed was doing well. It is about 24" high. I moved it outside for the summer and last night, a critter dug up and ate the pit. Will the plant survive with the pit gone? All else is intact. The roots are all good. Avocado Trees Periodically Have a Bad OdorI have a few avocado plants. 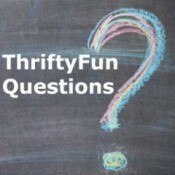 Is it normal that at certain times of the day they give off a bad odor? Avocado Tree Not GrowingI have an avocado tree that was planted by someone else. I don't know what type of soil they used, I know that they grew it from a seed. What can I do to help it grow? I've been taking care of it for a year and it has not grown an inch, what can I do to help it grow faster? 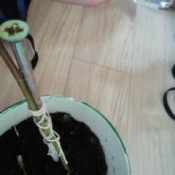 Tips of Avocado Tree Branches Turning BlackI have 3 avocado trees planted in a cluster outside. When they were first planted one lost nearly all of its leaves. They turned brown and fell off. I applied gypsum and months later it looks to be doing much better with lots of leaf growth. However I'm seeing some shoots/branches turning black. New Leaves Curling on Brown Turkey Fig TreeI have a brown turkey fig tree. The leaves are coming out good, but some are starting to curl up. The tree is about 4ft and in the open sun. Any ideas? Brown Turkey Fig Tree Has Soft BranchI like in the UK and last year I was bought a brown Turkey fig tree around 3ft tall. I am unsure of its age. I have espalier it and it is around 10ft wide now and 5.5ft tall. I immediately repotted it so the roots would have ample room for figaro to stretch his legs. I had around 10 figs the first year. Avocados Don't Ripen on TreeI have a great looking Hass avocado tree, about 6 years old. I get avocados, but they always stay green and hard and never get mature looking. Any ideas what can be wrong? 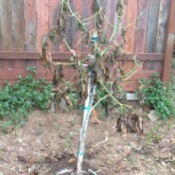 Caring for Avocado Trees That Were Not...We are renting and our well pump broke. 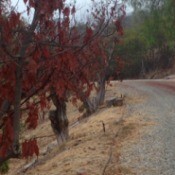 It took over 4 months to fix and so these trees have been through a summer in Ojai California (high temps) all summer. The landlords say that now that the well if fixed we just have to start watering, but I am not so sure. I am looking for expert advice. Fruit Don't Ripen on Cherry TreeThe fruit on my cherry trees remain hard. If I pick them will they get soft in time and ready to eat. Growing an Avocado TreeI have a tree that's only about three feet tall. One day I noticed that the top was dying, my first thought was to cut the top off so that it wouldn't spread. Now I'm scared that I stunted it. Is there any way to save it? Avocado Tree Broken in the WindI discovered that the top 80% of my avocado broke off in the wind storm today. What do I do to protect it and help it to heal? Growing an Avocado PlantI had an avocado plant; it was growing good it was already 8 feet tall, but one day I went out and when I got back home my plant was cut. They cut the top part off where the leaves were growing. What can I do to get it to grow again? The steam is still green! Growing a Cherry Tree from SeedWhen is the best time to plant cherry seeds and is Louisiana the right climate to do so? 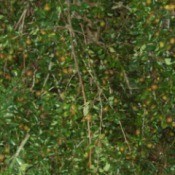 Growing Rainier CherriesI live in Tennessee. Can I start Mt. Rainier cherries from the pits and expect them to grow well here? Growing an Avocado TreeI have an avocado tree that was 4 ft high when I got it and growing well. I did not realize at the time that I needed to cut it back. Since then I have pinched it back, it has a lot of new growth at the top, but the now 8 ft tree still has a stalk no thicker than an inch or so. 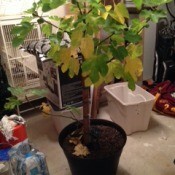 Brown Turkey Fig Tree CareI just bought a brown turkey fig tree (3 ft tall) for my mom. She lives in a trailer home and I'm concerned about where she can store it in winter. She does not have a garage. Any suggestions? Overwintering a Lemon TreeI am overwintering my 8 month old lemon tree, that was grown from seed, in the bathroom. I pinched off the new growth in October and it produced 2 new limbs. Will the top ever grow back? I use 1 tsp fertilome for citrus and organic fertilizer. 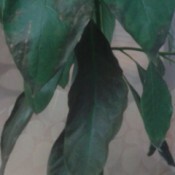 There is some older leaf damage from overwatering months back. Growing Limes and OrangesCan I plant my lime tree 20 feet from my orange tree? Overwintering a Musa Red Rowe BananaI never had a Red Rowe banana tree before. I live in the mid-west so it's in for the winter. Now that it's inside it has lost all the bottom leaves and of course it's growth has slowed. Can I propagate this plant and if so, how or is it best to leave it alone thru winter? Also, will it survive in low light? Avocado Tree Leaves Dying3 weeks ago my 1 year old avocado tree was hit by a wind storm that almost uprooted it. Since then, I moved it indoors, where it spent its first winter, last year. More recently, about 1 week ago, part of its leaves, mainly the oldest, but also some of the younger ones began to turn dark and dry. 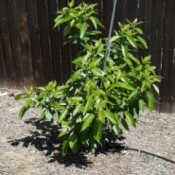 Avocado Tree Lost Its LeavesI planted my tree in the ground about 1.5 years ago and I believe I overwatered it. As a result the leaves browned and have since all fallen off. The branches are still green and I actually noticed some new leaves started to come up, but they have since stopped growing. Growing a Cherry Tree from a PitMy cherry seed has germinated producing white leaves. What is the problem? 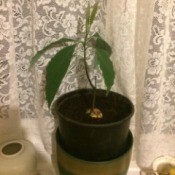 Growing an Avocado Tree from a PitI have a sprouted avocado seed. I went out today to buy the pot and soil. I came home and my almost 2 year old pulled off half of the root. Can I still pot it? Or should I keep it in the water to grow again? Repotting a Pear TreeIs it possible for me to re-pot my container pear tree now? 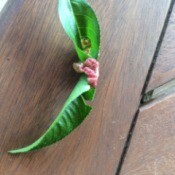 It is 2 years old and fruits are just starting to form, small buds. Will it harm the plant if I re-pot it now or when is it the best time? Growing Saskatoon (Service Berry) TreesI planted my Saskatoon trees about 4-5 years ago on a lawn plot. To date they are only about 15" tall with no berries. Growing a Weeping Cherry TreeWhat is the hardiness of the weeping cherry tree and will it grow in Colstrip Montana? Avocado Tree Leaves Turning Brown and FallingI have a 9 year old avocado tree and every year when the tree blooms, all the leaves turn brown and fall off and all the buds dry up, turn brown, and fall off. The branches are always green and as everything browns and falls off there is new growth, leaves and branches and such. 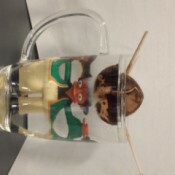 Growing an Avocado Plant from a PitI have been growing an avocado pit suspended in a glass of water for about 8 weeks now. The pit has split and I see the beginning of a root, but now fine white hairs can be seen on the bottom of the pit. Does this happen? or is this algae? Has this happened to anyone else? I have been changing the water once a week. Growing Apple SeedlingsOur granddaughter planted the seeds from three she was eating. They are now 6 inches tall and in separate pots on a south facing windowsill. Do they keep their leaves over winter this first year? They are staying indoors. Planting an Orange SeedIs it possible to plant the seeds of an orange to make an orange tree? Too Many PearsI have a pear tree that came with the house. It looks like it's been through tough times, but it bears fruit every year. I get hundreds of pears each season. I feel terrible that the tree branches are all hanging down from the weight of the pears. Growing Fruit Trees from PitsI started some cherry and Contender peach pits several weeks ago in my greenhouse. I checked and I might have a cherry growing, but it looks nothing like the seedling pictures, rather a small clump of purplish green leaves. I dumped a pot out and can't even find a pit! Help please. Fruit Falling Off Peach TreeThe fruit gets about a half inch, then dries up and falls off. Avocado Tree Losing LeavesMy tree is 15 feet high. I planted him from a seed. He had for the first time after 6 years 40 avocados, 2nd time 70, 3rd time 90. This year I don't know yet, but he loses a lot of brown leafs. Did I water him too much? Please let me know what I have to do. Thanks. Pear Tree Dropping FruitMy pears are about the size of a quarter. They are falling to the ground. What to do? Please help; the tree is loaded, but I'm afraid I won't get any fruit. 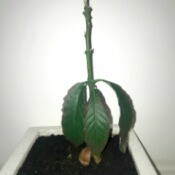 Avocado Leaves Died After BrowningI recently planted a 5yr old avocado tree that was beginning to flower. 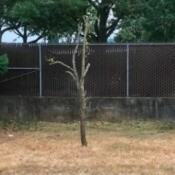 I (thought) I did everything I was supposed when planting, including fresh soil and deep watering, but since I planted the tree all the leaves have died and turned brown, but the branches are still green. Avocado Trees Losing LeavesI currently have 5 avocado trees no taller than 1 foot. It seems, no matter how hard I try I can't keep them alive past 1 year. The leaves have fallen off all 5 plants. 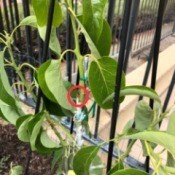 Growing a Peach Tree from a PitI'm a first time peach planter and I just wanted to know, but how far down do I need to plant the seed? 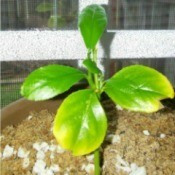 Lemon Tree Seedlings Have No BranchesWhy do my seedlings grow tall with large leaves, but none have branches? Should I cut them back and inch or 2? Where Can I Buy Cherry Seeds?I need to buy cherry seed. Where can I find them? How Long Before an Avocado Tree Flowers?I have a tree which is ten year old. It is not flowering. So I assume it is not old enough for flowering. Is there anything to do for that, like pruning or something else? My place is a hilly region with a tropical climate. Avocado Tree With Branches Low on TrunkI have a 5 ft tree in a pot. 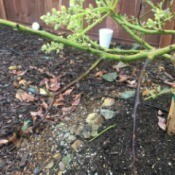 It has branches growing about 8 inches above the soil. It looks like where it was grafted. Are these suckers and what is the best way to get rid of them? Varieties of Apple TreesHow many types of apple trees do we have and how can one know the difference? Apricot Tree Lost All Its LeavesA few months back I bought an apricot tree (about 5ft tall), from Home Depot. I am in 10a zone (so.CA). Now at the beginning of August, my apricot lost all foliage (no leaves). What could possibly have caused it? I thought, apricots are evergreen. Avocado Tree DyingMy avocado tree is about 12 years old. It's planted in the ground, in Orlando. Each branch is turning brown and looks like the tree is slowly dying. It gets adequate water and fertilizer. I am not sure why it's dying. Is the root rotten?